Our laboratory offers full patient support along every step of the DNA testing process. Free confidential consultation is provided by our laboratory Monday to Friday 8AM to 5PM PST, 11AM to 8PM ET by calling 1-888-262-2263. SwabTest is the discreet paternity testing division of Genex Diagnostics, one of the largest and most reliable DNA testing laboratories in the world. 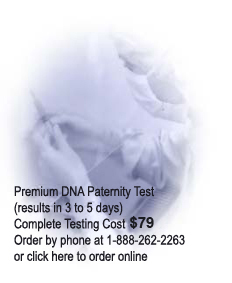 The original and trusted name for discreet paternity testing. We perform 3 out of every 4 private tests and we are one of the largest and most experienced DNA testing facilities. Because you are ordering directly from the laboratory, you pay less than with a broker, but the quality of testing is much greater. Your test is important to us. Do not settle for less. One of the most important factors to consider when choosing a paternity test is the reputation of the company which is performing the test. Companies which are officially listed with ISO 17025 have a solid reputation which they must live up to. Always ensure that your DNA testing facility is both ISO 17025 and AABB accredited. ISO stands for International Standards Organization which sets worldwide quality standards for DNA testing laboratories. Laboratories which hold both accreditations ensure the highest commitment to quality. There is no substitute for the prestigious ISO 17025 accreditation. Always check to see whether a DNA testing laboratory is ISO 17025 accredited. Previous Tip of the Month: Do not be fooled. Always ensure that the laboratory clearly states that the result documents are included in the cost of the test. Some laboratories charge a bargain price for testing, but do not include the testing kit or the result documents in the price. That means that once your test is completed, you will have to pay more for your result documents. Always check to ensure that the result documents are included in the cost of the test. SwabTest is the leading provider of confidential premium private DNA paternity testing services in the North America. Our technical team consists of the most experienced and highly qualified Ph.D level scientists in the field. We are one of the largest DNA testing laboratories in the world, processing over 100,000 individual patient samples each year and maintaining a perfectly flawless record. Our doctoral level staff have a combined 45 years of experience in molecular biology and medical genetics. All DNA tests are performed in our state-of-the-art DNA testing laboratory and molecular diagnostics facility. We supply DNA laboratory services to the public as well as providing paternity testing services to independent laboratories and government departments. By ordering a DNA test directly from our testing laboratory, you will receive wholesale pricing without the mark-ups charged by resellers and brokers. Additionally, buying directly from our DNA paternity testing facility entitles you to full technical support at all stages of testing and reporting from our laboratory technicians. SwabTest guarantees greater than 99.9% for inclusions and 100% for exclusions to ensure conclusive results. All tests are performed by certified Ph.D level doctors using the latest PCR technology and the full genetic report, DNA profile, and laboratory data are provided with each test. If you have a special request (e.g. split kit for testing in two different states, discreet shipping etc.) or if you are in a special situation, contact our laboratory at 1-888-262-2263 and our technical staff will be able to assist you. Save money by ordering direct from the DNA laboratory. The complete cost for a DNA test is $99 USD (results in 3 to 5 business days). Genex is not a broker. Brokers forward your samples to another laboratory for testing and charge a marked-up price for the test or provide very low quality tests for low prices. Buying directly from Genex allows you to save time and money by dealing direct with the testing laboratory. Usually resellers do not have an address or operate from postal mail boxes. Just look for the address. If the address for the company is missing or if the address has the letters "PMB" (stands for Postal Mail Box), it is likely you are dealing with a online reseller, not a laboratory. Do not be fooled. By ordering directly from the testing laboratory you pay less than with a broker, but the quality of testing is much greater. Your test is important to us. Do not settle for less. We are one of the largest providers of legal and private DNA paternity testing services and we sell more DNA home testing kits than any other company. We are one of the largest and most experienced DNA testing facilities in the world. We have sold thousands of testing kits to patients throughout the world, process over 100,000 individual patient samples every year and have maintained a perfectly flawless record. We have lived up to our promise for each of the tens of thousands of patients that we have helped over the years. By choosing a large and well established laboratory, you will benefit from our years of experience and our vast resources. Our laboratory is equipped with the most modern instruments and utilizes the newest DNA technology. Smaller testing facilities often do not have the resources to purchase expensive automated laboratory equipment and cannot produce the high quality testing offered by larger labs. We offer a full 100% money back accuracy guarantee. We guarantee >99.9% for inclusions and 100% for exclusions, ensuring that conclusive answers are provided for every paternity test. All DNA tests are automatically run TWICE to ensure complete confidence in all results. 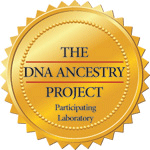 Industry leading premium DNA test. 16 loci including the core CODIS loci (the gold standard for human identification) are analyzed for each test. Results for paternity tests are released in 3-5 business days. Once the results are completed the patient has immediate access to retrieving them. Our home testing kits are easy to use, allowing the DNA testing process to be fast, simple, and hassle free. Collection is fast and simple, and results are available as soon as 3 days after testing. If you proceed with private testing and decide later that you need to have a legally admissible test performed, we will deduct a portion of the price of your private test from the cost of the legal test so that you do not need to pay twice. All legal DNA tests are AABB accredited and ISO accredited with a strict-chain-of-custody and are fully admissible in court in every state in the world. The legal tests are recognized for use in immigration, child support, and estate dispute issues. Our laboratory ensures the highest testing standards. Our testing laboratory participates in the Paternity Testing Proficiency Program of the College of American Pathologists (CAP) which includes rigorous laboratory proficiency testing three times each year. The complete DNA fingerprint and laboratory data is provided for every test. Express next business day 24 hour shipping available. Online 24/7. If you are not satisfied with the services associated with a kit from another company, be informed that SwabTest is a trusted DNA laboratory which will be able to provide you with a much higher quality test at a lower cost and faster turnaround time using the swabs that you have received. Our laboratory will be able to assist you directly at staff@swabtest.com. We perform 3 out of every 4 private tests and we are one of the largest and most experienced DNA testing facilites. Why are the following testing standards important to your test results? Do not be fooled by "free" kits and resellers. DNA testing is a very serious matter which may affect the rest of your life. Patients often do not carefully check the quality of the test that will be performed on the samples. Full technical support is available directly from our DNA laboratory at every stage of your entire testing and reporting process from our skilled technical staff and scientists. Our laboratory staff will be happy to answer any questions you may have during regular laboratory hours at 1-888-262-2263.